It's been a very post-apocalyptic few weeks. Luke and I finally got around to watching the first season of Walking Dead (which rocked my socks directly off), and I finished reading the Hunger Games trilogy (only about a year later than everyone else. What of it?). This prompted us to have a nice, lighthearted chat about the end of civilization as we know it. Me: Yeah. I am so not going to make it out of any end-times scenario alive. I don't run, I have no coordination, so shooting is probably out, and the last time I held a baseball bat, I ended up in the emergency room with a busted finger. Luke: True. You might not even make it out of the house. Me: I mean, I'd be a great person to have with you, because I always have like twenty bottles of water in my bag. And I would probably be able to McGuyver some spectacular crap out of busted hubcaps and crumpled leaves. Luke: Truthfact. But you would probably break your neck tripping over the dog or something before a zombie even showed up. But once you got out of immediate danger, you'd probably outlast the rest of us. Me: Whaaa? With all my hunting and survival skills? I am no Bear Grylls. Luke: Yeah, but once you were out in the wild, you'd have an easier time adjusting to eating squirrels and berries. Because of the no gluten thing. Everyone else would be like, "Waaaaah! Where's my bread?" But you would be like, "eat these dandelion greens." And you wouldn't be going through the human-food detox, because you've already been through it. So, there you have it. Fellow GF-ers, rest assured that in case of zombie apocalypse or societal breakdown, as long as you can scavenge for small game and plants, you might outlast your gluten-y counterparts. If all else fails, learn how to shoot straight. I'm really surprised my local pizza establishments haven't filed a missing person report on me. I think I might be offended. One of the gifties in my "Welcome to the Celiac Club" basket was a bag of Bob's Red Mill pizza crust mix. Since I was off dairy for a while, and since non-dairy cheese does not exist to me, it sat in my pantry until last night. I figured it had been two months since I'd enjoyed the pie, and it was a gloomy sort of day that pretty much required junk food, so I gave it a go. The crust mix is pretty straightforward, you just add eggs, olive oil and warm water. 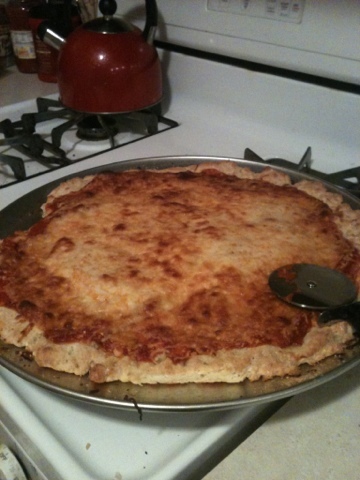 They even throw in a handy-dandy pack of yeast, so you get that "real" crust feel. We used some Classico pizza sauce (because I love supporting companies that list the GF status on the label!) and a few kinds of cheese. We would have put more on, but I accidentally ate half a bag of mozzarella while I was waiting for my dough to rise. The finished product tasted really, really good. When I make it next time, I think I am going to give the crust a little longer in the oven before adding sauce, because it was a little doughy, but that might just be the consistency. Taste-wise, it was pretty epic, and even Luke, a self-proclaimed pizza snob, said he'd eat it again. Plus, I have enough left over to enjoy again tonight. Between the pizza and an ice-cold Pepsi, I almost felt like a human being again. Thanks, Bob's Red Mill, and thanks again University of Chicago. You are the gift that keeps on giving ... well, until I run out of goodies in my bag. So. The last thing you need to hear as someone who is already a little OCD is that any teensy, tiny speck of a crumb can make you sick. In order to keep your sanity intact, you try your best to keep a clean kitchen, clean dog, clean husband. You scrub everything you own, run the dishwasher like it's your job, hose down cabinets and double-foil every item of bakeware you use. And it's still not enough. Because the gluten's gonna get you. 1) Something I bought that was labeled GF was, in fact, NOT GF. 2) Stray crumbs have been sneaking into my food. 3) Someone is trying to kill me. I reeeaaaalllly hope it isn't the third. Because, you know, I don't want to have to go all Celiac Ninja on someone. It puts me in sort of a quandary though. I don't want to be that person who lives like a shut in germaphobe (any moreso than I already am), and I don't want to spend another weekend in pain and hating life. So what do I do? If you would have told me six months ago I'd have to weed through my makeup, beauty products, shampoo, so on and so forth, looking for hidden gluten, I would have suggested you take your crazy to TLC, where they embrace such nonsense. I haven't gotten through everything yet, because the thought of tossing some of my more expensive products seems senseless to me, and I have so. much. makeup. You'd think I was creating a sequel to Avatar with the stash I've got, and sorting through it kind of gives me a panic attack, so for now, I am ignoring it. Well, not ignoring. But focusing on the bigger things. One worry I had is that buying specialty stuff would be super-expensive, but alas, I was able to find a treasure trove of gluten-free beauty items from Kiss My Face. I'd heard of the brand before but never used it, and since I am incredibly picky, I was worried I would shell out all of this (GF) dough for something I would hate. Not the case. One of the first items I picked up was the Start Up face wash. It feels really great, leaves a smooth clean, and kind of smells a little like a margarita, but not in a strong, overpowering way. I really like it, and it made me confident enough to purchase a few more products of theirs, like their Cell Mate moisturizer slash sunscreen, and their Grapefruit and Bergemot hand cream. 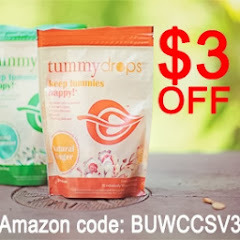 One of my favorite things about the company is that right on the Web site for each item, it lists it as gluten free (and vegan, and not tested on animals, and all that other crunchy stuff). I wish more companies would take the guess work out of it and state the ingredients/potential allergens so clearly. Yay, Kiss My Face! You are full of win. There's this campy, delightful Chinese restaurant near my house that's been open since the '70s, has questionable food practice standards and killer tropical drinks, and was my introduction to the beauty that is sesame chicken. It also just so happens that I drive past this once-favorite restaurant on my way to and from work everyday. I tried to ignore it, and for a few weeks, it worked. Until a few days ago, when I started jonesing for some Chinese. Since I have been trolling the Celiac discussion boards for almost two months now, I saw that loads of people were raving about the GF options at P.F. Chang's. I'd never been there before I was anti-gluten, but with the craving raging, Luke and I decided to visit our local "Puff Chang's" for a late lunch on our day off Monday. I was impressed immediately. Not because the restaurant itself looked cool (it did), and not because the gigantosaur chandeliers were fabulous and dangerous. I was amazed that P.F. Chang's doesn't have a separate, crumpled, single-copy gluten free menu. Instead, they include it with the regular people menu. That's right, this franchise treats GF dining like it is normal. I told my server right away that I would be dining GF that afternoon, and he immediately grabbed a couple of the sauce bottles off the table and told me not to touch them. He brought out gluten-free versions of the soy sauce and potsticker sauces for me, which was awesome. I also got to try their famous lettuce wrap appetizer (it was so good, Luke even ate it. And he hates lettuce. And other healthy things). I ordered their spicy chicken, and all of the GF items I ordered came on special plates with the restaurant's logo on them. The portions were huge, and when we couldn't finish, they sent us home with extra rice to eat with our leftovers. Plus, our server even bagged up my leftovers in a separate bag (the hubbs ordered a gluteny main dish) so that they wouldn't be contaminated. And those leftovers? Reheated amazingly. Hooray for two nights' wort of food from one meal! Bottom line? I will SO go here again. There's already other things on the menu that I want to try, including a couple of desserts. I really need to get better about taking pictures of my food:) Hopefully the next installment will have photos! I'm not naturally patient. I have to force it. Not with the kiddos I see on a daily basis, they are fine. But adults? Adults reaaaaaalllly try my patience sometimes. And I had a humdinger of an experience this past weekend that really tested it. Since Groupon is the new black, we've been finding all kinds of awesome deals for restaurants, classes, etc. So when my father-in-law bought a Groupon for dinner for six at a local restaurant/pub a few months back, Luke and I were psyched to go. We never turn down free food, and getting to see his parents is always a blast. But that was all B.C. (before Celiac, in case you missed that). So when the hubbs informed me that we would be trekking out for lunch on Sunday to a place that has wheat stalks in its logo, I got a little nervous. We both called the place, and the manager assured us (separately) that though they didn't have a formal GF menu, they were very "gluten-free friendly" and that my server could give me options for many dishes that would be safe and delicious. But I couldn't shake the feeling that this place was either going to cross-contaminate me or just outright gluten my face in. But Luke told me that I should give it a try, that I can't live in a bubble, and that I am going to have to trust people (fat chance, friend). I was petrified. Since I have been glutened, twice now, I know what it feels like, and I was in no hurry to experience that again. Our waiter was a guy with a whole lot of personality, but not a lot of culinary knowledge. When he came over to the table the first time, I told him I was Celiac and needed to eat gluten-free. He looked at me blankly for a minute, but then had the decency to admit he didn't really know what that meant. I took out my handy-dandy restaurant card and gave it to him, and as he scanned it, he asked if he could keep one for the kitchen. I let him take it, hopeful that maybe someone else's meal would be easier because of it. But then he told me that I should be fine if I got something that wasn't pasta. Face palm. While everyone else enjoyed their beer, I sipped on a wine (not bad), but when it came time for appetizers, I was out of the loop. Even the "gluten-free special" appetizer was some chicken skewers marinated in a sauce our waiter couldn't explain. So I watched, as everyone noshed on nachos, and chicken, and crab cakes and jalapeno poppers. I watched. Salad course was okay, basically just lettuce with olive oil on it. Figured that was safest. I gave him pretty explicit instructions that croutons should not be anywhere NEAR my plate, and it came out clean, so I think he was listening. But when it came to the main course, he didn't seem to know any of the answers to my questions. He couldn't tell me how the asparagus was prepared. Or what was in the mashed potatoes. So I simply asked for a steak and baked potato, both cooked in foil, please. Not the most tasty thing I've ever eaten, but I am pretty sure it was safe. The hardest part was dessert. Not one thing. NOT A SINGLE THING on the dessert menu was even close to being gluten-free, and as someone with an incredible sweet tooth, it was devastating challenging to watch everyone chow down on the beautiful, beautiful desserts. I seriously considered getting up and hiding in the bathroom, but as Luke refused dessert, too, I felt like I owed it to him to stay there. It's hard to get mad at the waiter, or even the manager, for not knowing what restrictions that we GF diners have to follow. I mean, for normal people, this is so off the radar that it's impossible to blame anyone for not realizing that you can cross-contaminate in the blink of an eye, or that even things that seem safe (sauces, marinades, etc.) could be dangerous. I guess it opens up a good opportunity for dialog with some of these places, and I admire the fact that our waiter took the card from me (now, whether or not he threw it in the trash is another question entirely). *Typically, restaurant reviews would fall under the Gluten-Free Gluttons post, but since I didn't want to name this place (they are a one-location restaurant), I handled it differently. I think it is admirable when restaurant staffs want to learn, so I am not going to call them out for ignorance. I will be contacting the manager though, to let her know that "gluten-free friendly" is a little different than what she thinks it is. I also have to explain that my dinner guests were not in favor of watching me suffer - the appetizers and desserts were part of the coupon, not just exercises in Alissa's restraint. Wow. Had a total whine-fest earlier. Now that that is out of my system, let's get back to today's regularly scheduled post. 2. I was a bad librarian and didn't devour the Hunger Games books when they first came out, and even last year when I read the first one, I wasn't in love with it. But last night I read book 2, and I cannot wait to get home to get started on book 3. Maybe it is because I have been filling my brain with every Celiac and gluten-free guide I can get my hands on, but mama needed her some YA fiction. 3. I have amazing friends. Not only have they put up with my crazy new lifestyle, they have embraced it, choosing restaurants that are safe for me, sending me recipe links, and picking up GF snackies for game night so that I would feel welcome. Seriously guys. I lurrrves you! Today's post was going to be one of my Three Things Thursdays, and it was going to be loaded with gluten-free puppies and rainbows and ice cream cones. Because as of two hours ago, I was in a great mood. I felt so fabulous, I even went for a run this morning. And no one was even chasing me! It's ridiculously unseasonably warm in Chicago, and after my run, I thought it was the perfect time to grab a delicious, iced coffee beverage on the way to work. I checked my discussion forums, to find out if what I wanted was off limits, and headed to Starbucks. I was psyched, because I can have dairy again, so I ordered a caramel macchiato. I figured since the boards said it was safe, and it wasn't being blended, I was fine. Not so. I had a suspicious nagging in my head, so when I got to work, I did some more searching. Since it seemed okay, I started sipping, but about two gulps in, I found something that made me stop. A recently dated post on a board that the caramel topping was not GF. So I did what I should have done in the first place and called Starbucks customer service. The rep I got told me that I was lucky to get her, since she is gluten-free, too. She then proceeded to tell me that nothing Starbucks has is gluten-free, because of the potential for cross-contamination. I pointed out that I just wanted to know about the ingredients, not the cross-contamination. She gave me some long schpiel, beating around the bush until I interrupted her. I just wanted to know if ANYTHING used to make my drink had gluten in it. "Oh yeah," she says. "The caramel topping has gluten in it." She told me that even the drip coffees from the beans can possibly have gluten in it. I already know Dunkin' Donuts is off limits, and now Starbucks doesn't seem viable either. Where, then, am I supposed to get my iced coffee goodness? Or do I have to give that up, too? Just angry now. Mad at myself, for being so careful about everything and then essentially throwing away all the hard work on something stupid. Mad at Starbucks for being douchey and delicious and full of gluten. Mad at Celiac for making me have to give up yet another thing I like. Bite me, Celiac. Bite me. I am having a passionate affair with my slow cooker. It all started a couple weeks ago. I had a little bit of a sniffle, and wanted some home-made chicken soup. But seeing as I have no time to actually *home make* it, I busted out the ol' slow cooker and made some of the best chicken soup I've had in ages. So this week, I wanted something hearty and a little spicy, so I tweaked an old favorite Weight Watchers recipe to make it gluten-free. I put it in the slow cooker before work, and after worrying about my house burning down a nice, productive work day, I came home to a pot full of deliciousness. 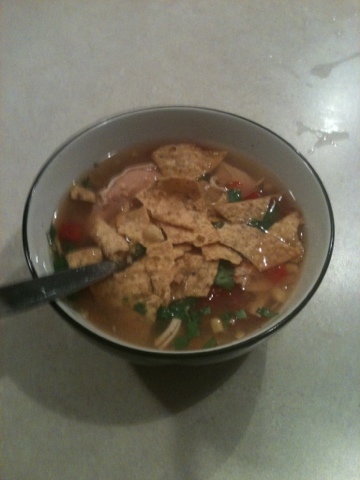 The good thing about this soup is you can play with the flavor a little - I like mine less salty, since I crumble up the tortilla chips to put in there, but you can add more as needed. I won't lie, I ate my whole pot full in about two days. Something freaky is happening to me. Not in that Teen Wolf, "Why is there hair there?" kind of way. But close. The other day, I was standing within 6 inches of hot, cheesy pizza. And I had no desire to eat it. None. It happened last week, too, with cookies. I'm pretty sure my taste buds are tweaking out. I haven't had a craving for, like, the blood of a virgin or anything, but a few days ago, I would have punched babies for a hard-boiled egg. A hard-boiled egg. I don't even LIKE hard-boiled eggs, but there I was, 8 o'clock at night, boiling 'em up like we were about to go all PAAS dye on them. That's not the only thing. I find myself really yearning for fruits, and God forgive me, vegetables. WHAT IS WRONG WITH THIS PICTURE?!? Anyone else have these sort of changes happening when they went off gluten? Or am I going through some sort of delayed taste-bud puberty? Wow, where did this week go? Guess that's what happens when you skip Monday. Maybe I should make a habit of it? 1. Starbucks Blonde Roast coffee is my new crack. Not that my old crack was, well, crack. Anyway. 2. It's really exciting to find a new, delicious-looking GF product like, say, lemon muffins. Conversely, it is really disappointing to get them home and discover they are moldy. Wah-waaaaah. 3. I cannot WAIT for this. It has dinosaurs. And GF recipes. And is for kids. Anyone else got three things to share? I made it to another milestone - my first GF roadtrip. We had to trek downstate to see my sister's dance team compete in the state-wide championship (go, Emily! ), and while I was psyched to see my mini-twin doing what she does best, I was a little worried that my food options would be, um, non-existant. So Luke was a complete doll and snagged me a whole box of treats from Sweet Ali's, which has some absolutely epic food. I had cookies, toffee bars and trail mix galore, plus about a ton of other snacks that live in my car now in case of food emergencies. Plus, we had a great GF experience at Ruby Tuesday. Needless to say, I didn't go hungry, but I also didn't get glutened. Hooray! Warning: This is a bit heavier than my posts have been previously. It may sound whiny. It may sound self-absorbed. And it is. But I needed to write it. This? This is hard. I know it's not "I have cancer" hard, or "I lost a limb" hard, or even "I have a peanut allergy" hard, but it is hard none the less. No, I don't have to go through chemo, or have any permanent changes to my (outer) body. I don't even have to worry about going into anaphylactic shock if I eat gluten. But kissing my old life goodbye? Easier said than done. I read somewhere that people who are diagnosed with Celiac go through the same stages of grief as those who have lost loved ones. At first, I thought that was some really self-absorbed bunk, but the further I get into this, the more I start believing it. That was pretty much my reaction when the doc first asked me if anyone had ever tested me for Celiac. I then spent the next week reading everything I could get my hands on, which, since I am a librarian, is a lot. I disregarded much of it, or rationalized it, or flat out denied that it applied to me. Which worked until I got my blood test results. I got angry. I got "throw empty (plastic) bottles at your husband's head" angry. I was pissed at the world, for being so full of delicious, delicious gluten. I was pissed at my doctor, for not finding this out sooner. I was pissed at myself for waiting so long to see a specialist. I was angry at every fast food place, restaurant, food manufacturer or distributor, cosmetic company and person I saw. I was mad at my family for not being sympathetic enough. I was mad at my husband for being too sympathetic. I was mad at my friends for not being psychic enough to know that I was mad at them. 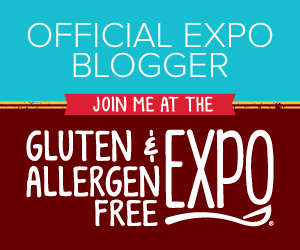 I was infuriated with every future situation that would have me missing out on something because of Celiac. I was livid. I was very good at this part. This. This is where I spent a lot of the past two weeks. It came in waves. One day, I was feeling optimistic. The next day, not so much. It got worse after I got glutened, because then I found that despite my best efforts, food can still make me sick. It was like being a 13-year-old girl all over again. No one gets me. No one cares I am going through this. No one understands that I am sad. I almost started wearing too much eyeliner, and I found myself wandering through Hot Topic. Thankfully, I snapped out of it before dyeing my hair black like the raven I am inside. I turned upward two days ago. Could have been that the effects of this weekend's glutening had worn off, could have been that it was almost 60 degrees and sunny. Could even have been that it was Leap Day, and I had images of Leap Day William in my head all day. Either way, I was inspired to cook dinner when I got home. I am planning now for my life without gluten. I have a day trip this weekend that is causing me a little anxiety, but I know how to be prepared for it, even if it means bringing my own cooler of snacks. The more times I am able to say "no" to once-favorite foods, the more empowered I feel. Granted, I am still a little sad, but I also know how to control my situation. I wish I was there already. I see glimmers, I do. Like thinking about how I can't wait for summer for all the fresh produce. Or getting psyched when I see a great looking slow-cooker recipe that can be adapted to be GF. Or when my mom tells me she's been calling restaurants and won't stop until we find a safe place to eat. I see it there. Those moments are fleeting, but I am less than a month in. I think it will be a while before I can look at a regular old gluteny cookie and not have the slightest desire to nom nom nom that crap up. I think that when I drive past a restaurant we used to frequent, my brain will still want to stop for sliders, or sesame chicken, or soft pretzels, or pie, or pizza, or any of the things that are off-limits to me unless I make them with MY special ingredients. I'm not there yet. But I think I am heading the right direction. 1. I think I am entering the "rage" portion of this whole debacle. Everything is making me super angry this week. Work, food, home, food, FOOD, lack of food. ANGRY PANTS. I seriously thought I might shank a brother for some ice cream. This no-dairy phase needs to be over, stat. 3. After watching the whole Oscar telecast Sunday, I have come to the conclusion that Angelina Jolie is Skeletor. 2. My baby sister is competing at the state poms and dance team competition on Sunday. I don't get the whole "poms" thing, but Emily is great at it, and no matter what happens, I couldn't be prouder of her. Awwww. I know.